Renn Mill Center Inc. is a rural based manufacturing facility located in Central Alberta. Our range of world class equipment includes Livestock Roller Mills, Commercial Grain Rollers, Crimper Mills, Auxiliary P.T.O Mills, Blower Mills, Grain Baggers and Grain Bagger Unloaders. The 15 years of continual development on our Grain Bagger and Unloader systems assures peace of mind in protecting your valuable grain for just pennies a bushel with a field proven combination delivering high capacity, commercial longevity and operator convenience. Whether unloading from trucks or grain carts or both at the same time the structural integrity and operator efficiency of this field proven bagger will deliver the capacity and commercial longevity our customers demand. 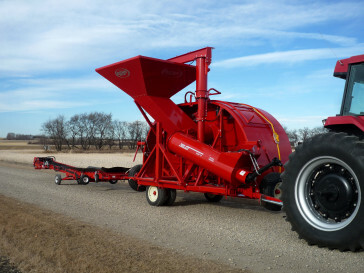 The patented Unloader design features a high volume discharge auger capable of loading trucks in minutes. The unit converts from transport to operating mode quickly to begin unloading 9 ft, 10 ft and 12 ft diameter bags while spooling up the empty bag for ease of handling and recycling. Renn™ integrity and operational efficiency are the engineered foundation of our Bagger and Unloader systems. Our P.T.O. portable mills come in a wide variety of sizes to serve a vast range of applications and a number of different commodities. The Renn™ Roller Mill is an industry standard with 50 years of dependable feed processing. Renn Mill Center Inc. is committed to equipping, training and enabling our people with the skills, resources and drive to design and produce world class farm machinery that delivers superior production efficiency for producers in the markets we serve. To learn more about the Renn Mill Centre please click here to go to their website.